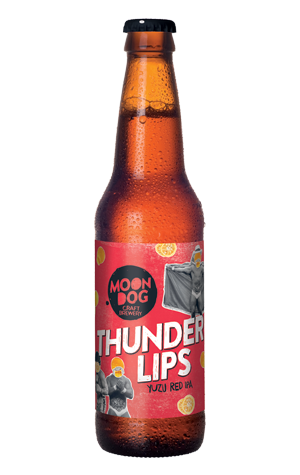 Having built a large production brewery a few metres down the road from their original brewery in 2016, the amount of beer coming out of Moon Dog in recent times has been rising rapidly. Not only is their core range spreading ever wider across Australia and making inroads overseas, but it's steadily expanded to include five beers – not bad for a brewery that spent most of its life without one. Now they've settled into a groove at the larger site, the production of the more outré beers with which they made their name has increased in frequency too. The first such beer to make it into bottles in 2018 is Thunder Lips, a Yuzu Red IPA. Yuzu is a popular Japanese citrus fruit that's not too far removed from a grapefruit. So, what does yuzu do when chucked inside a red IPA? Well, in the case of Thunderlips, it retains all the classic hallmarks of the style, being piney and bitter with a rich, malty sweetness too. But as you might expect, it's citrus that leads the charge, and does so with an almost mandarin like quality that flits between being slightly juicy and very zesty.